As a general rule, the second time’s always easier. You’ve got a general idea of how things are supposed to play out, and hopefully picked up a few things from your first experience. That’s not to say it’ll turn out better, but at least you’re getting yourself into. After the Sloan show, it ended up being almost a year before my next concert experience. And in that year, a decent amount of things had changed. I’d started my first real job, was about to start college, and for the first time in my life, I wasn’t single. The job was a nice change of pace from the part-time work I’d been doing at a local golf course. Not that the golf course was a particularly bad place to work, but it wasn’t without it’s hazards. My main jobs there involved picking all the balls up from the driving range, cleaning them, and then getting everything set for the next day. Seems safe enough…. The thing is, walking around a wide open field and picking up balls with a PVC tube, makes you a pretty attractive target for anyone with a golf club, and the love of a good challenge. After braving a few near-misses, I figured it was time to break out the big guns….THE POULAN. The Poulan was a marvel of golf-course technology. A riding lawnmower with an attached Popemobile-style cage that would keep the rider safe from even the most enthusiastic golfer. It even had an attachment that would pick up all the golf balls for me. The only real problem with the Poulan was its notorious unreliability. In order to get to the field where all the stray golf balls were, I had to go down an extremely steep hill, and make a sharp right-hand turn at the bottom. On one of these trips, right after I started down that 45º incline, the brakes decided to give out. As the Poulan approached speeds that no riding lawnmower was ever built to handle, and the Popemobile cage rattled around me, I figured that a dismount would be safer than sinking with the ship. After flinging open the cage door, and tossing myself into a nearby bush, I decided that I’d rather chance a golf ball head-shot, than take my chances with a lawnmower rollover. As nice as the switch in employment was, the biggest change that year was my relationship status. Going into high school, I assumed that I’d walk out with two things for sure: some kind of luxurious facial hair, and a girlfriend. Sadly, the facial hair didn’t show up with any kind of consistency until I was well into my 20s, and the whole girlfriend thing took a bit longer than expected. If my years of watching Saved By The Bell had taught me anything (aside from the dangers of caffeine pills), it was that high school relationships were a foregone conclusion. I mean if Screech could pair up with Tori Spelling, then I was guaranteed to meet that special someone. Except it just didn’t happen. Now being an awkward teen isn’t exactly unheard of, but I’ll try and provide a bit of personal background. A good chunk of my base-interpersonal skills come from how much time I spent with my great-grandfather growing up. While Granny was always the talkative, outgoing type, Pa tended to err on the quiet, and contemplative side of things. He was the type of guy who would never be accused of talking to hear himself speak. If he didn’t feel like there was an immediate need to make his thoughts known, he just wouldn’t. As a result, everyone that knew him would immediately give him their undivided attention if he showed even the slightest intention of speaking up. With my mother being a single, working parent, I spent a lot of time with my great-grandparents. For the amount of time/effort they put into raising me, they were essentially parents, and with my dad not being a huge part of my life, Pa was my de facto father figure. He built me a swing from a tree branch, we’d play catch in the yard, and he’d gladly sit through any Disney movie that I was in the mood for. I really couldn’t have asked for more. For all the time we spent together, we didn’t spend much of it talking. It wasn’t your typical awkward silence situation though. We just had this ease with each other, and a comfort level where speaking wasn’t all that necessary. Spending the majority of my younger days living as an only child, being quiet was my comfortable norm. Pa related to that quieter nature, and we really just “got” each other. Unfortunately, this shared stoic nature didn’t do me many favours when it came to social situations. Around people that I don’t know very well, or most of my family, I’m the quiet one. The one who takes things in, thinks them over, and picks my time to speak very carefully. If I don’t have something exceptional to say, I’m perfectly content to stay silent. Around friends however, this dynamic changes up quite a bit. I have this instant comfort level, and all of a sudden, I feel like I always know what to say. There’s a confidence that comes over me, and I go from being a quiet observer, to the extrovert of the group. I draw from that social energy, and boom, I’m the me that I want to be. The change can be so drastic, that sometimes I wonder which one’s the “real me”. Am I a quiet person that projects confidence to fit in? Or am I this entertaining individual that feels repressed a good chunk of the time? Honestly, I have no idea. That outgoing persona’s great, except for the fact that it usually relies on my knowing someone for a while. Usually, I’ll get put in a situation where I’m forced to be social (work, a party, some group project at school), and I’ll slowly gain that comfort level, start acting like myself, and maybe end up with a new friend. It’s a time-consuming system, but if somebody makes it through that whole process, they’re pretty much guaranteed to be my friend for the long haul. It’s a great system for building lasting friendships, but makes meeting new people (specifically, potential dates) a little tough. Through high school, I stuck with a couple of groups of friends, and didn’t branch out all that much. It wasn’t until grade 12 that my main group of friends somehow joined up with a group of girls. Here was this readymade group of friends, that had spent their entire elementary, and high school careers growing, and refining into a solid social unit that seemed just like ours. It was like the Chipmunks teaming up with the Chipettes, and all of a sudden we’d found ourselves a supergroup. Instead of a group of guys meeting up at the same spot in the hallway to eat lunch, we had a crew with our own table in the cafeteria. For the rest of the year, we spent all of our spare periods together, and hung out every weekend. A few of us that lived east of the school made a habit of walking home together every day. We had a little convoy going on, and as we’d get near the first person’s house, we’d stop and chat for a while. Eventually, they’d head home, the rest of us would walk to the next branching point, chat some more, and the process would continue until there were only two of us left. The whole thing changed my 15 minute walk into a 90 minute relay, but it was a real highlight of my time in high school. With all the bonus chat time the last two of us got, I gained that comfort level, and we ended up becoming really good friends. She even gave me some dance lessons to prepare for the year end semi-formal. After graduation, our supergroup went on a camping trip to Pancake Bay. The two of us spent most of the trip together, and were practically dating by the end of the summer. She ended up leaving town for school, but we stayed in touch, and decided to go from practically dating, to actually dating once the Thanksgiving break rolled around. 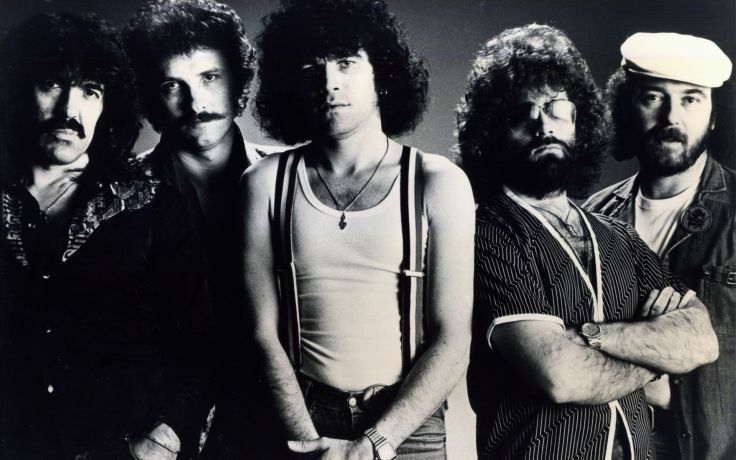 Flash forward a few months, and four of had our tickets in hand, and were all set to see Nazareth at the Eastgate. After the Sloan show, I felt like a pro at the whole concert thing. The Eastgate was a bit different though. The entire crowd seemed a good 30 or 40 years older than us, and gave off a real strong grisled-biker vibe. Needless to say, four kids under the age of 20 stuck out a bit in the sea of burly individuals, with beards and tattoos. Not exactly my usual scene, but there I was, fresh out of high school, surrounded by a crowd of completely sloshed, 50-something couples, slow-dancing to “Love Hurts”. The show didn’t quite have the same impact as the Sloan gig, and honestly, I don’t think there was any way it could have. While I didn’t walk out of there with a new favourite band, I did have a great time. I mean, how many other acts would treat you to a bagpipe/talk box solo?